Splatoon 2 features a brand new bonus shop that lets you trade in food tickets for XP or cash bonuses in online battles. 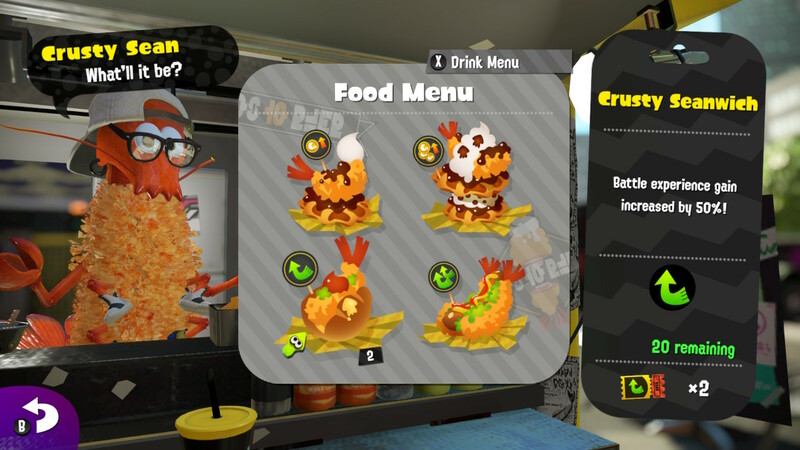 Food tickets are partially located hidden throughout the Octo Canyon story mode, but they're really, really rare. You'll have to explore the deep dark corners of every stage to get your grubby, inky tentacles on these valuable items. But they're so worth it. Here, we'll show you have to max out your XP tickets -- the 50% XP tickets to be exact -- and it doesn't take that much time. You won't even need to complete the story. Just finish the first three levels and the boss, and these tickets can be all your's. To use this quick farming trick, you'll need to reach Sector 2 in the Octo Canyon story mode. From here, you'll need to uncover Level 6 "Octozeppelin Invasion" to start hunting for tickets. You don't need to complete all of the Sector 2 levels, when you complete Sector 1, just launch pad to Sector 2 and uncover the hidden Level 6 entrance if you haven't already. 1. Go to Octo Canyon and fast-travel to Sector 2, Level 6. 2. From the Level 6 entrance, jump down to the rectangle platform straight ahead (past the three crates) and look on the right edge. 3. There's a secret little platform on the right side of this lower building. Break the crates to reveal an XP Food Truck Ticket. 4. Open the map menu and press [+] to return to Inkopolis Square to save your game. 5. Return to Octo Canyon, jump to Level 6, collect your ticket. 6. Rinse and repeat for an endless supply of tickets. There are more tickets in more Splatoon 2 levels, but this is by far the fastest way to get as many tickets as you can carry! The counter goes up to x99, and you can fill that up pretty quick by visiting this little spot.